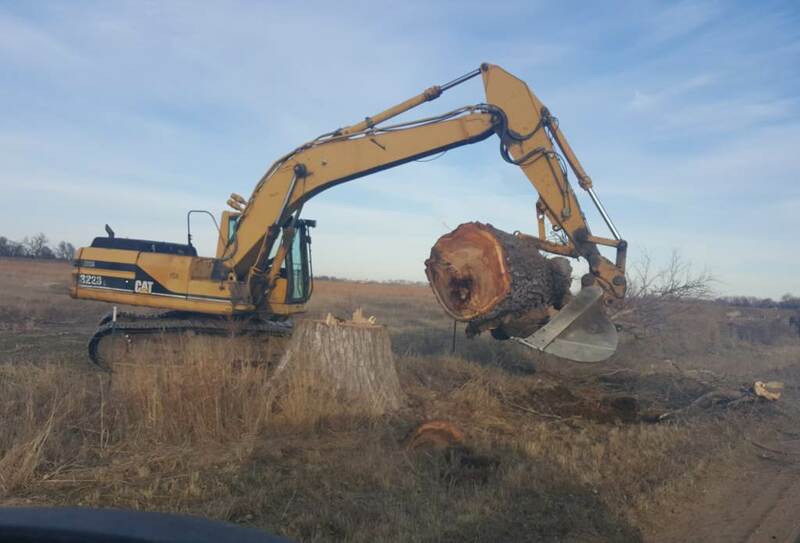 Tree removal done in winter by Wichita Tree Service owner Robert Phillips. Do you have a dead or dying tree? Do you need to remove a tree to build a deck, building, or other project? 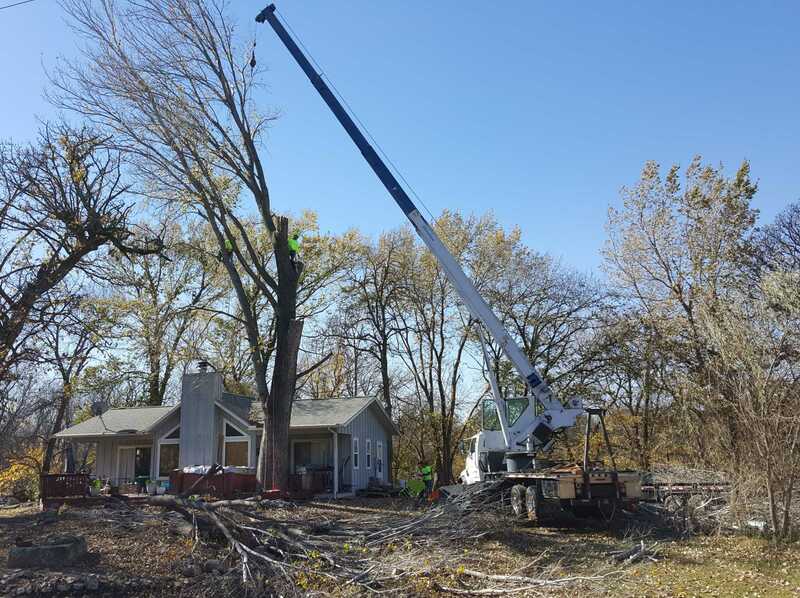 At Wichita Tree Service large tree removal is our specialty. Do you have a tree that another company turned down because it is too difficult or there is no room to drop the wood? Call Wichita Tree Service. We can pick up the whole tree with a 50-ton crane and set it in the front yard! Have a tree in the back yard that other companies want to charge an arm and a leg to remove because they can’t get their bucket truck in the backyard? Wichita Tree Service has 5 experienced tree climbers along with compact equipment to get in tight spots. We can get the tree down safely! Have a stump in the backyard that another company can’t get to? Call Wichita Tree Service. We have one large stump grinder that fits through gates. No gate, no access at all, no problem. We have a smaller stump grinder that can be carried by 2 people or if need be lifted with a crane. 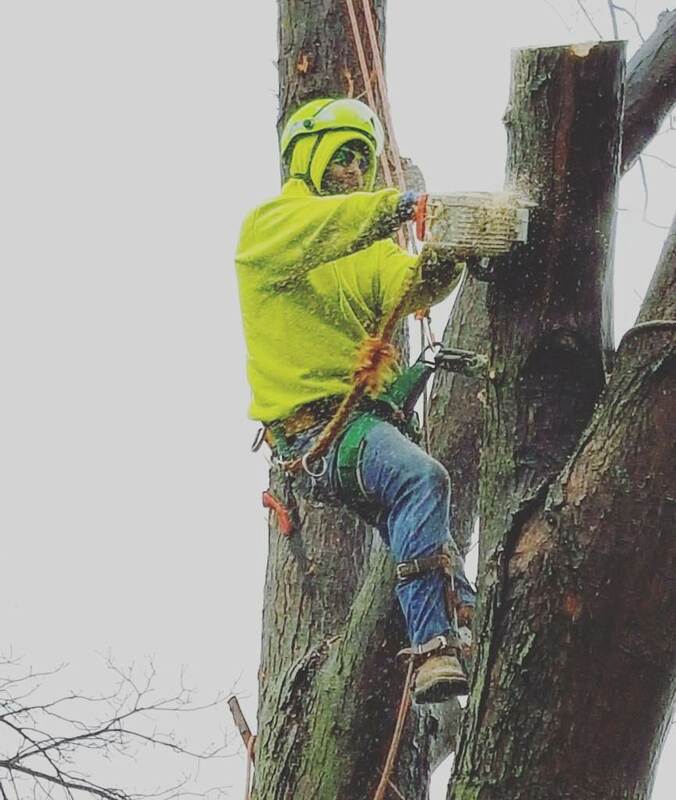 Even though tree removal is often a last resort, removal is sometimes necessary for dead or dying trees, trees that are in the way of something you are planning to build, or trees that have been badly damaged in wind or ice storms. If you do get a tree removed we recommend also getting the stump removed. If we remove the tree we will not charge full price to grind the stump($4.5 per inch.) If you have any questions or need a bid about tree removal give me a call. –Insurance is a must for Tree Removal, they need to have at least $300,000 in general liability. 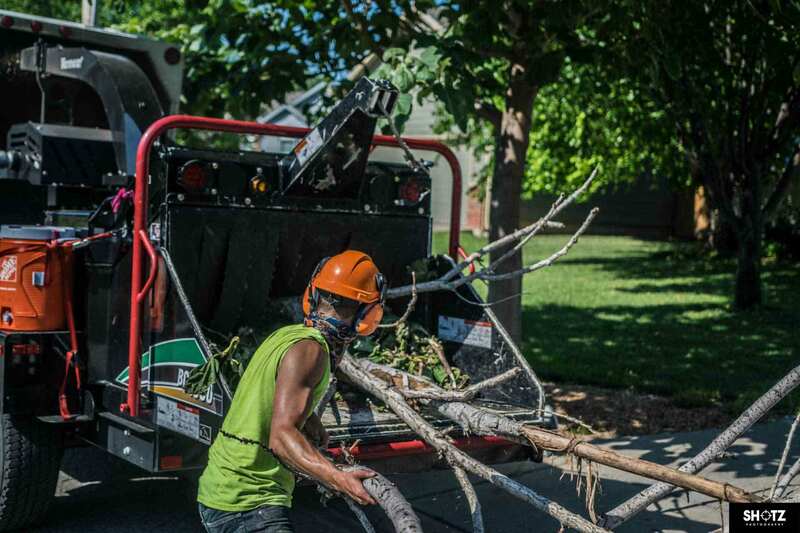 That is the bare minimum to protect you, I would recommend going with a company with much more than just the minimum, In Wichita alone, I have heard many story’s about trees falling on houses, and some of the stories are about professional tree service companies. I often get called out to homeowners that cut the tree down and need the stump removed. My first question to them is always, “what did you break?” It is vary rare that they don’t break anything. Most of the time it is just a damaged gutter or fence but once I had a guy point to his neighbors house after asking that question. When I looked to where he was pointing, the tree was gone but their was a huge hole in then neighbor’s roof along with damaged siding, gutters, and a broken window. -Don’t try to remove a tree that’s out of your league. I often get called out to homeowners that cut the tree down and need the stump removed. My first question to them is always, “what did you break?” It is very rare that they don’t break anything. Most of the time it is just a damaged gutter or fence but once I had a guy point to his neighbor’s house after asking that question. When I looked to where he was pointing, the tree was gone but there was a huge hole in the neighbor’s roof along with damaged siding, gutters, and a broken window. NO Tree is worth your life, or health. property damage is one thing, but I have also had Customers that now only has us do his trees because the last time he did it himself if cost him tens of thousands of dollars in medical bills after he fell and landed on the bed of his truck. –Are they a licensed tree service, are they a real company or a fly-by night operation? Are they an LLC or a corporation? Research them online. –Do they use or require employees to wear safety equipment? That is a big one for me, especially when it comes to tree removal. Forestry hardhats are a must! They are $50-70 and can save your life. A log dropped on your head from only 20 feet can kill you even if it is a small log. Trees in Kansas can get up to 70 ft tall. My company has dropped logs that can weigh 50-1000 pounds. Forestry helmets not only protect you from falling logs or limbs, they protect your hearing from loud chainsaws,(The big ones are extremely loud) and they have a face mask to protect your face from chainsaw kickbacks and sawdust that could get in your eyes. –Don’t hire a tree service after just a knock on your door without properly vetting them. Many of these services have no idea what they are doing. They could get hurt or damage property. I can almost guarantee that they will harm your tree if they are trimming it. -Don’t always go with the cheapest bid for this could be a sign that they are uninsured or unskilled. There are also some companies that come in with the cheapest bid and when the work is done raise the price on the invoice. They may charge for “unexpected difficulty’s” and/or “The job took longer than expected”. If you hire Wichita Tree Service, the price I give you at the estimate is the price you pay when the job is done. –Go with Wichita Tree Service!